It’s great that you’ve finally decided to take a Spanish course, but have you considered the benefits of studying Spanish in Spain? Learning a second language is a big challenge, especially if you’re only learning from an app or a book. If your language learning isn’t multifaceted, it’ll take a longer time to learn Spanish. That’s just one of the examples of the benefits of studying Spanish in Spain: you’ll be speaking Spanish sooner! To help you decide the details of your language learning journey, let’s get into more of the benefits of studying Spanish in Spain. With so many interesting reasons to learn Spanish, it was an easy decision. Now, you just have to decide how you’re going to learn Spanish. There’s sure to be Spanish courses close to your home but if you don’t live in a Spanish-speaking country, you won’t be immersed in the language. Moving to Spain to study Spanish would be a complete immersion in the language! You’ll learn new words in every shop you visit. In fact, that’s a wonderful chance to become proficient in Spanish. You’ll also have millions of chances to practice speaking Spanish with locals, giving you a more comprehensible Spanish. Studying on the beach is great for your Spanish and your tan! Learning Spanish will be far from boring if you take a Spanish course in Spain. Opportunities to learn Spanish will surround you! You’ll hear Spanish songs playing on the radio and your brain can even start to learn them without paying attention. It’s much better to focus on the lyrics if you are going to learn Spanish songs, but there are endless hits to choose from in Spain. You could also spice your Spanish lessons up even more by taking a paella-making class or a flamenco dancing class in Spanish! The benefits of studying Spanish in Spain amount to more than just fun lessons; they’ll give you memorable life experiences. Spain is one of the most popular countries in the world for tourists. With so much delicious food, awesome festivals, and beautiful beaches, you’ll never want to leave! You don’t need to take time off from your studies to enjoy Spanish culture. Spain has a high-speed train that travels to the diverse regions of Spain on a daily basis, so traveling is a breeze. That’s one of the best benefits of studying Spanish in Spain: you don’t have to be a full-time tourist to enjoy Spain’s tourist attractions. You can visit ancient wonders like Peñiscola or Alhambra on the weekend and head back to class on Monday. 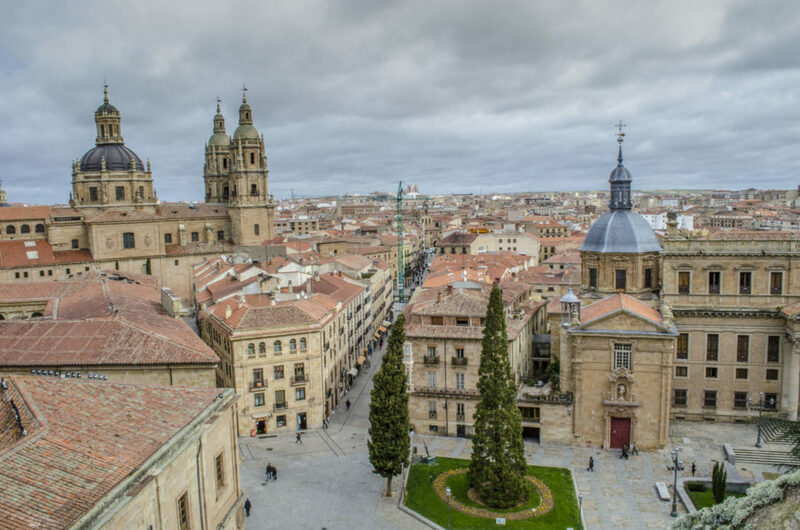 See the breathtaking sights of Spain on the weekends or afternoons. The benefits of studying Spanish in Spain are too many to count. The only remaining question is: what are you waiting for?